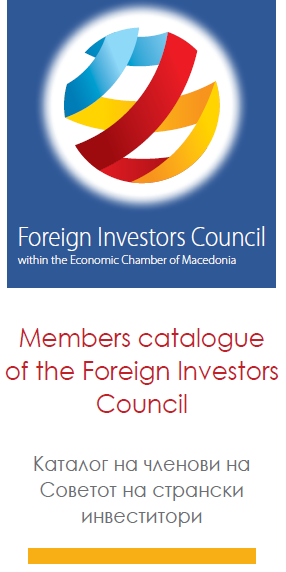 In accordance with the Decision for establishing of a Foreign Investors Council as of February 7th 2006, the Foreign Investors Council is established with the purpose to provide consulting and advisory views and proposals in accomplishing the goals and tasks of the Economic Chamber of Macedonia, its organs and bodies and the functioning of the Macedonian economy. The Foreign Investors Council will have consulting and advisory function for the most important issues in the economic sphere, for the needs of the Chamber’s organs and bodies, especially for issues that will induce the investment in the Macedonian economy. These Rules of operation of the Foreign Investors Council shall improve its functioning. 1. Members of the Foreign Investors Council shall decide upon common issues at the Assembly of the members. The Assembly shall be held at least once yearly. President of the Foreign Investors Council is chairman of the Assembly and the Management Board. 2. Each member is entitled to one vote during the voting at the General Assembly. 3. Тhe Assembly decides by majority votes of those present or represented members. The Chairman of the Assembly shall have the deciding vote in case of tie vote. 4. The Assembly may take decisions via e-mail sent to the appointed representatives of all active members. - Other general issues of the Council. 6. The Assembly may also take decisions by electronic communication, in a manner proposed by the President of the Assembly. 7. The Assembly shall be convened by the President of the Association on his own initiative or at the request of at least 1/3 of the total number of the members. 8. The invitation for the Assembly shall be submitted no later than 7 days prior to the Assembly to all the members of the Association. Foreign Investors within Economic Chamber of Macedonia. 3. Each active member company can nominate only one candidate for the Management Board. Management Board member should speak English language. 4. The mandate of each Management Board member shall be two years. 5. Each Management Board member can serve more mandates, but not more than 3(three). 6. Management Board member should actively participate in the Management Board work and contribute to the FIC development. 7. Management Board member should objectively and accurately presents interests of FIC members. 9. The Management Board member mandate will stop automatically if he/she without justified reason does not attend two consecutive regularly scheduled meetings. 10. The Management Board meetings will be held upon President` s request or upon request to the President by at least two Board members, but at least once per quarter. 11. The Management Board shall reach decisions by simple majority vote i.e. majority of present members. 12. The President shall have a deciding vote in case of a tie vote. 13. The Management Board may also take decisions by electronic communication, in a manner proposed by the President of the Board. The work of the Council is organized and coordinated by a President. The President of the Council by its function is the Vice President of the Assembly of the Economic Chamber of Macedonia. The mandate of the President shall be two years, with possibility to serve more mandates. In case the President cannot attend a meeting of the Management Board or is not able to fulfill his duties the Vice-President of the Board will undertake the duties of the President. If the President resign, be revoked or in any other way is unable to permanently perform the President's duties, the Vice-President will take his place. There can be one or two Vice-Presidents. These Rules of operation of the Foreign Investors Council shall enter into force on the date of enactment and are complementary to the Rules and Principles and methods of work as of February 17th, 2006. Any proposed amendments to this Rules of operation of the Foreign Investors Council shall be enacted on the basis of a Decision adopted by the Assembly.